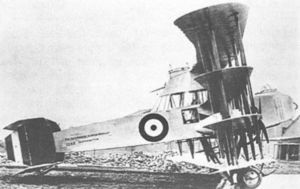 The P.B.31E Night Hawk, the first project of the Pemberton-Billing operation after it became Supermarine Aviation Works Ltd., was a prototype anti-Zeppelin fighter with a crew of three to five and an intended endurance of 9-18 hours. It was first flown in February 1917 with Clifford Prodger at the controls. It had six-bay swept quadraplane wings and a biplane tailplane with twin fins and rudders. The fuselage filled the gap between the second and third wings; the cockpit was enclosed and heated. For armament, it had a trainable nose-mounted searchlight, a 1�-pounder (37 mm) Davis gun mounted above the top wing with 20 shells, and two .303 in (7.7 mm) Lewis guns. Power for the searchlight was provided by an independent petrol engine-driven generator set made by ABC - possibly the first instance of a recognisable airborne APU. It was advertised as being able to reach 75 mph (121 km/h), but the prototype only managed 60 mph (97 km/h) at 6,500 ft (1,981 m) and took an hour to climb to 10,000 ft (3,048 m), which was totally inadequate for intercepting Zeppelins. Given the Anzani engine's reputation for unreliability and overheating, it is unlikely that the aircraft would have delivered the advertised endurance either. Andrews, C.F. ; Morgan, E.B. (1987). Supermarine Aircraft since 1914. London: Putnam. ISBN 0 85177 800 3. Bruce, J.M. (1969). Warplanes of the First World War: Volume Three: Fighters. London: Macdonald. ISBN 356 01490 8. Mason, Francis K (1992). The British Fighter since 1912. Annapolis, Maryland: Naval Institute Press. ISBN 1-55750-082-7.